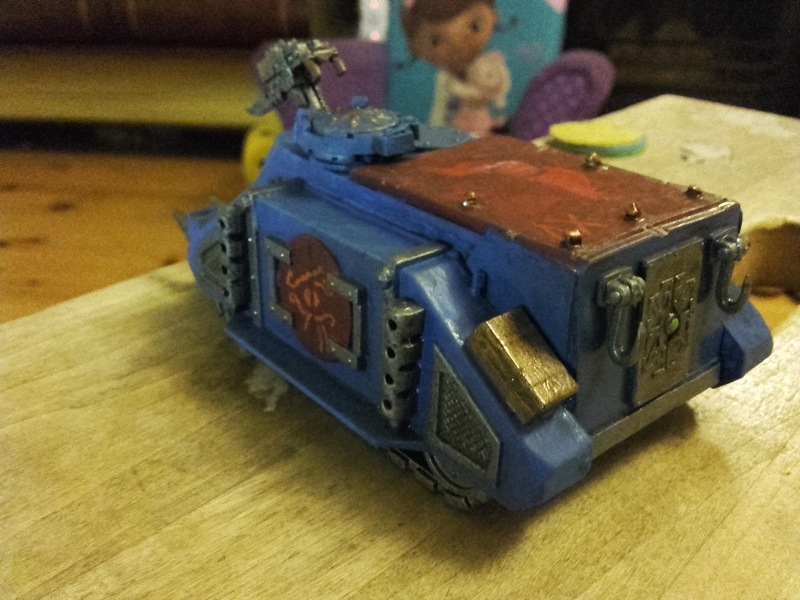 Well yesterday was my birthday and I threw some paint on my Rhino at last… then the Blogger app wouldn’t let me upload anything. This proved some what frustrating as you can imagine. None the less we get on with things, you’d expect nothing less from a veteran of the Long War. I am still working on getting a proper lighting setup, so please excuse the quality. First Thousand Sons Rhino: One careful owner. 10,000 years on the clock. This is the finished product of the Rogue Trader Era Rhino I started to work on. I figured I better get it across the finish line at this stage, so I did. All in all in was done in two sessions, although it does need a coat of varnish but the Irish weather system is all over the place at the moment. 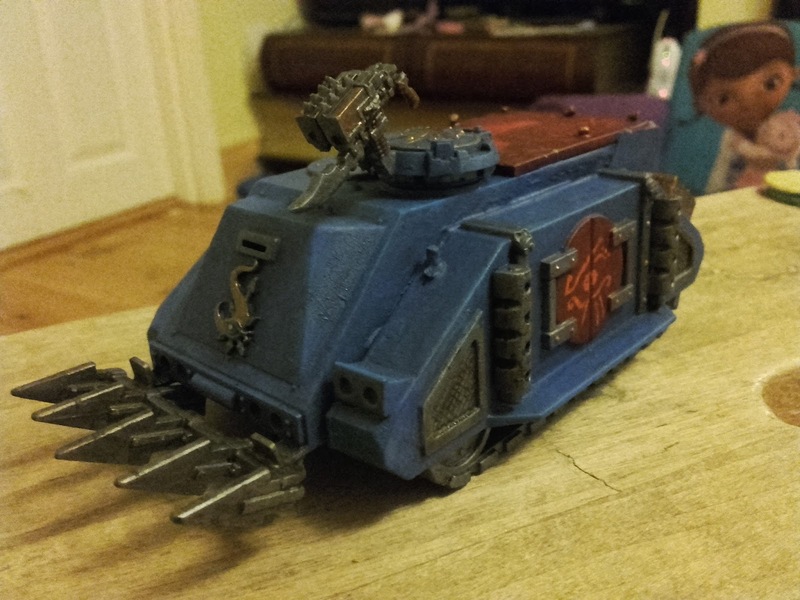 First Thousand Sons Rhino: More free hand attempts. It is hard to tell but all the edgse have actually been highlighted with a lighter blue, I wanted to make sure this wasn’t overpowering at all though. Maybe I should have made it a little starker though. You can also see on the side there some attempts I did at more freehand. I wanted to go with a vague Egyptian stylised eye and I think it works. The other side failed miserably and will have to be re-done. 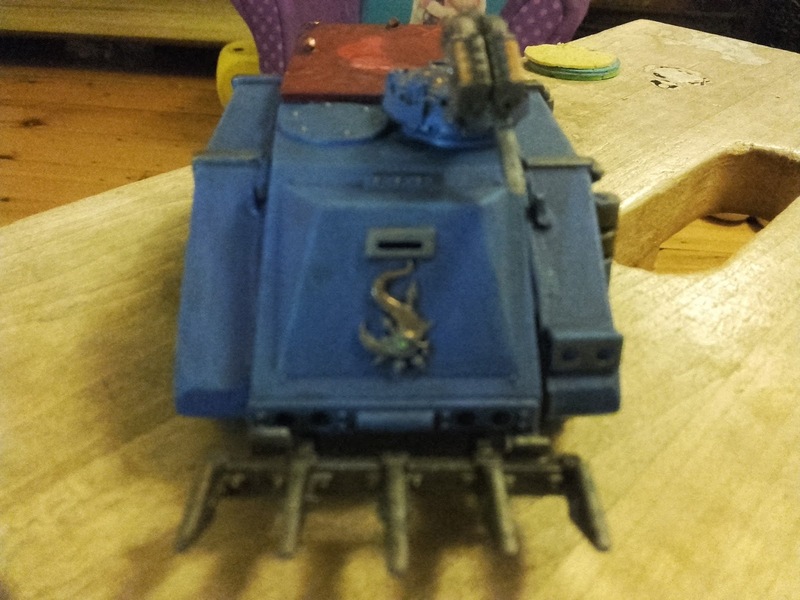 First Thousand Sons Rhino: Extended rear. This is when the Rhino really changed, it got an extended caboose. I made the whole chasis sit up a lot higher on the tracked sides and used my meager plasticard skills to extend the end of put a extra door on the back. The gubbins at the back from some bits of spare chaos vehicle sprue I had, it makes it look a lot less plain. 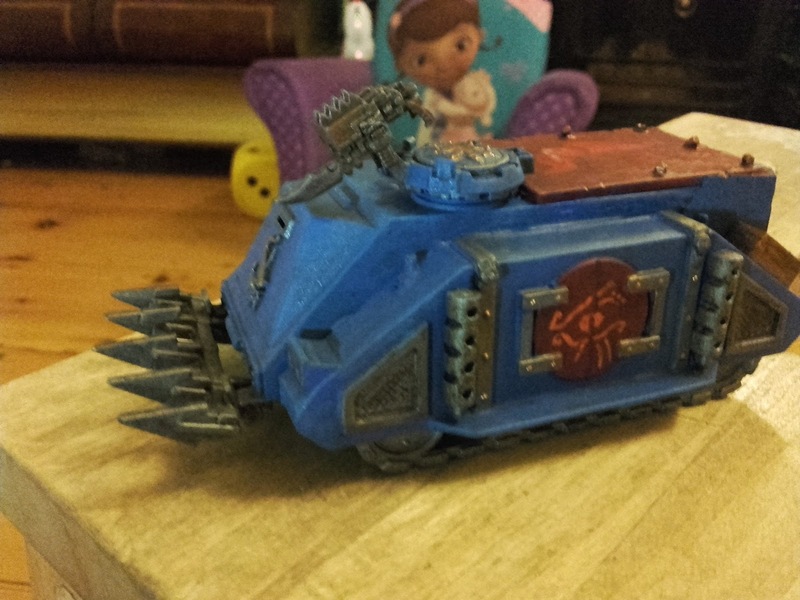 First Thousand Sons Rhino: Ramming time! First Thousand Sons Rhino: Roof detail. Attempts to do freehand on the roof didn’t turn out too well though. 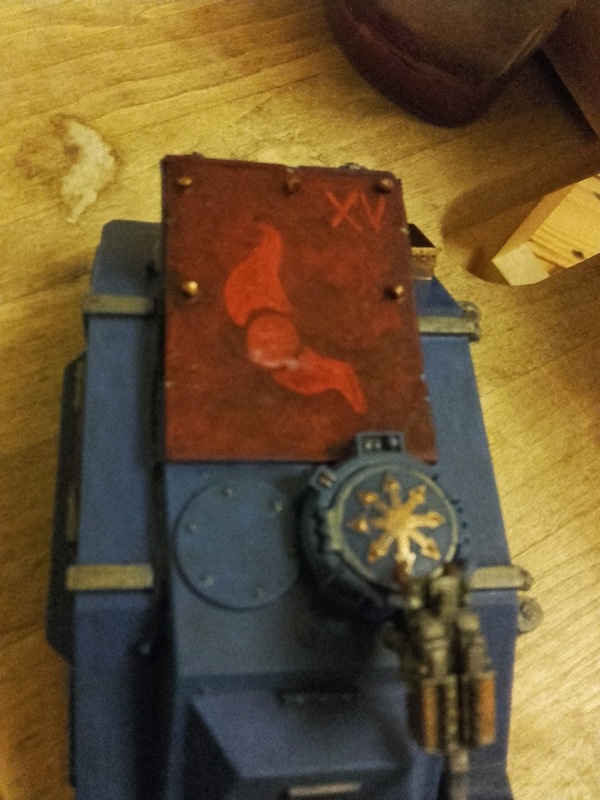 Initially I wanted to do something like trapped souls in the deep red but that just wasn’t working out, so I tried the typical Tzeentch symbol and you can see how well that went. Still one down! One to go! Keeping with the idea of giving one blog shout out per post I want to draw your attention to a new blog starting out, I feel partially responsible for getting them to start it so I could see more of their stuff. Paint’ in Amateur is a dual language blog showing a much more realistic style than I could ever attempt. Very much worth a look.